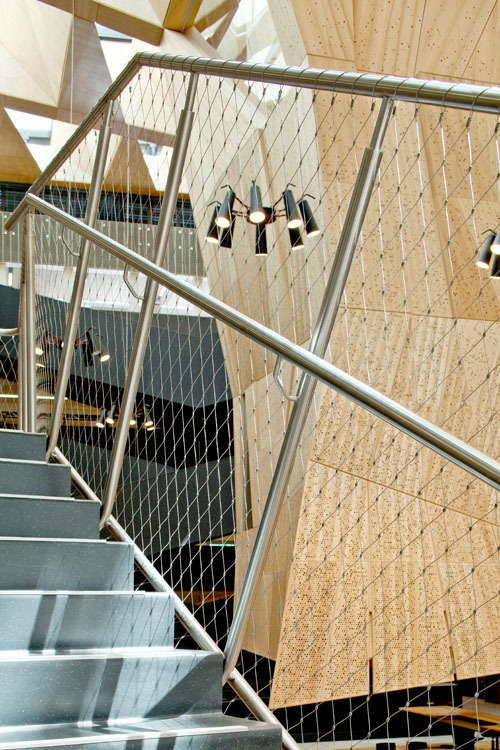 Over 1200m2 of stainless steel mesh stretches the entire height and span of the five storey atrium of the new University of Melbourne’s School of Design showcasing the aesthetic and functional possibilities of this dynamic product. 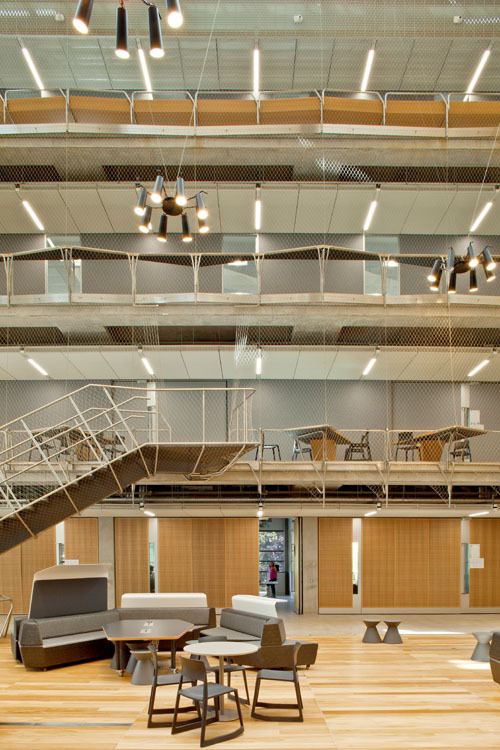 Designed by local architects John Wardle Architects (JWA) in collaboration with Boston based firm NADAAA, the building houses the university’s faculty of architecture, building and planning. 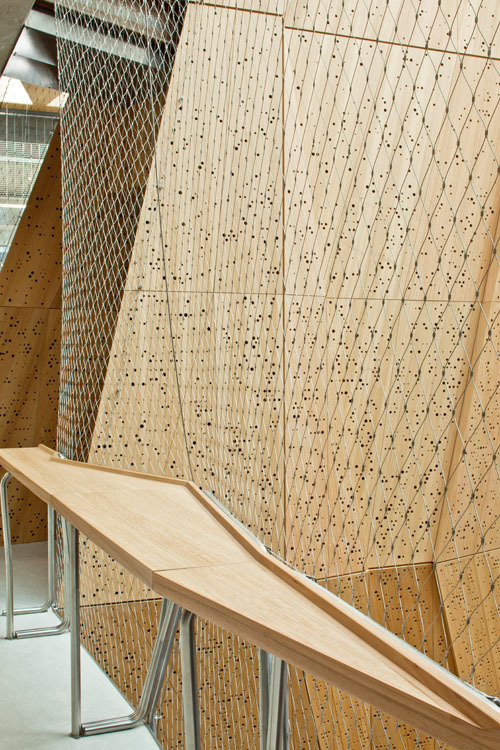 The building is intended as both a place of learning and as a teaching tool in itself. 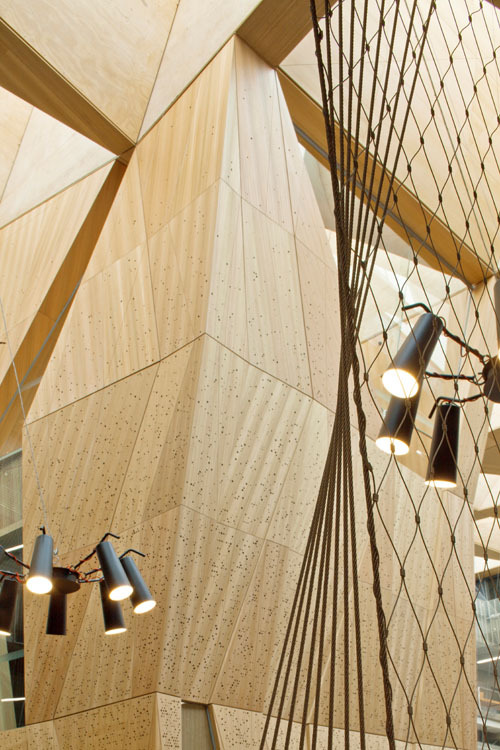 Materials are raw and exposed, allowing students an insight into construction techniques and fabrication. 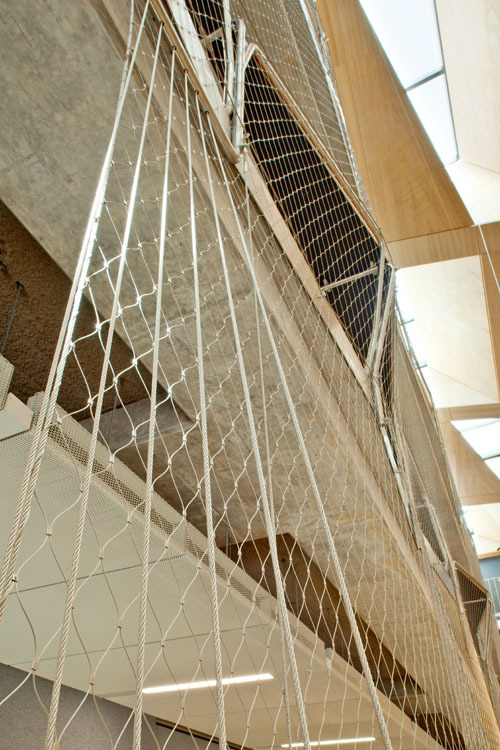 The Architects were attracted to using Webnet mesh because of its simplicity and almost ethereal veil. 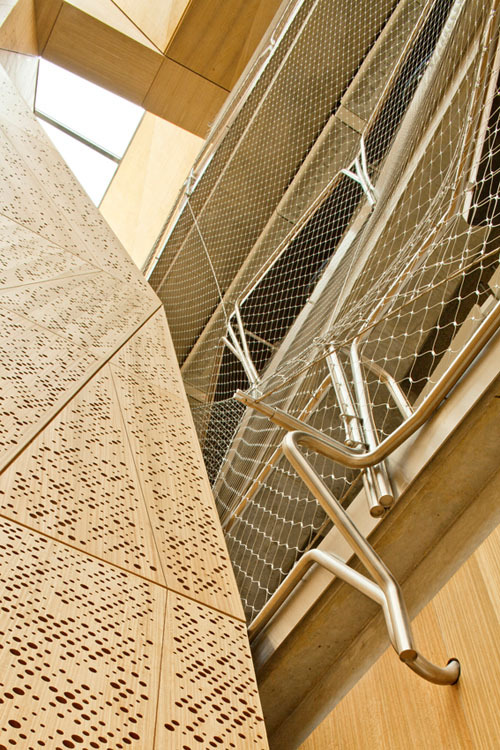 The mesh provides a safety barrier between levels, whilst still maintaining transparency, sight-lines and air flow. Engaged from design through to construction, the project is the most complicated installation Tensile has attempted thus far and 3D modelling was essential to get all components correct, especially for the 750 individual and unique pieces of tubing. 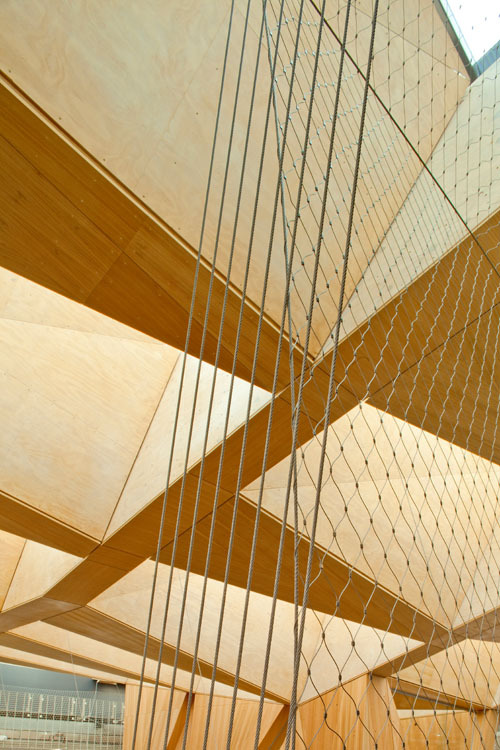 The mesh and perimeter fixing details made it very easy to work with the complicated geometry of the hanging studio and the atrium slab profiles. Along with the 1200m2 of stainless steel mesh, over 4 kilometres of support cables, 1500 metres of stainless steel tube, along with countless fittings, fixings and custom components complete this complex project. As with many of the projects Tensile is engaged for, we were selected for our ability to innovate and collaborate. Throughout the project we were in constant consultation and discussion with both JWA and NADAAA for design resolution and refinement. This solution would be suitable for all sizes of commercial and institutional projects. 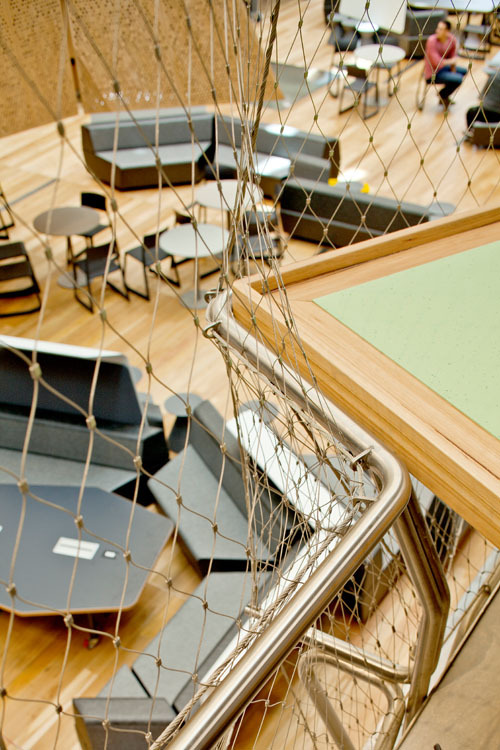 The mesh provides a discreet protective and supportive structure whilst providing an elegant spatial design element. It is a highly flexible solution which can be used to form a plane surface but can also be tensioned into three-dimensional forms featuring funnel-type, cylindrical, or spherical shapes.